However, they've overlooked his greatest enemy -- the hypervigilant copyright attorneys employed by The International Red Cross. They're almost as vicious as Girl Scout lawyers! I always like the thoughtful super-hero fashion design stuff at Project: Rooftop, and this looks like another great feature. 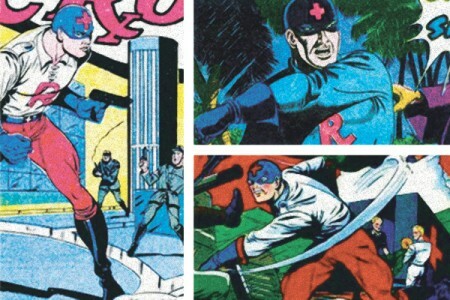 There was a similar character in the Golden Age called “War Nurse”. Is War Nurse in the public domain? I’ve been making my way back through that site, looking at all the redesigns. I’m very impressed! They come up with some great designs by some great artists. I’m now itching for a redesign contest here! Howard Johnson is right! We DO need another redesign contest! @Danny Beaty- War Nurse is in fact in the public domain, enjoy! Thanks Mr. Giordano! I’m guessing you know quite a bit about the history of comic books.